Andrew Hart is the Chief Executive Officer of The Oaks Academy. 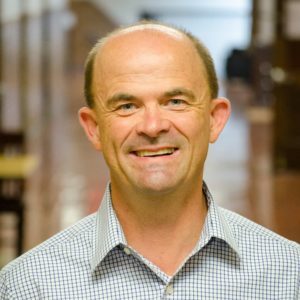 He served as the Head of School at The Oaks from 2002-2015. Under his leadership, the school has grown to three campuses serving more than 800 students in the 2017-2018 school year. Andrew is a thought leader in education and a passionate advocate of the Indianapolis community. In 2017, he was honored with the Sagamore of The Wabash award, one of the highest honors for an Indiana citizen. Previous recipients include presidents, astronauts, ambassadors, musicians, artists and citizens who have contributed greatly to ‘hoosier’ heritage. Andrew was honored for his 15+ years of service leading The Oaks Academy. At The Oaks, he is responsible for all aspects of the school including oversight of the finances, fundraising, administration, and academic program. Andrew is a founding Vice Chairman of the Board of Herron High School, an urban classical charter high school. He received his MBA from the University of North Carolina, and prior to The Oaks he worked in Marketing Strategy and Business Development at Eli Lilly and Company. Andrew Hart, CEO of The Oaks Academy: What does it mean to be classical in a world that is chasing the new? Often in education we see trends in curriculum, teaching methods, and philosophies. We hear buzzwords like grit, tech integration, and positive behavior management. In the race to be innovative, educators are constantly searching for what’s most effective.